After some great diving yesterday ..just not by me :-) the sea still looked great for a dive this morning even tho the east was on the water. My mate Mike is down in the eastern Cape, and got a great Garrick yesterday. Apparently the Cracker ar loose as well. So I am sure he will have some more pics by the end of the week. Mike Constantino 17.2kg Garrick shot somewhere in the Kei. Andy finally sent some pics from his Tanzania trip, I am still hoping that he will do a write up on his trip as it sounded like they had some serious challenges with stuff being stolen and big fish swimming off with their kit. Andy and a Doggie that did not get away. 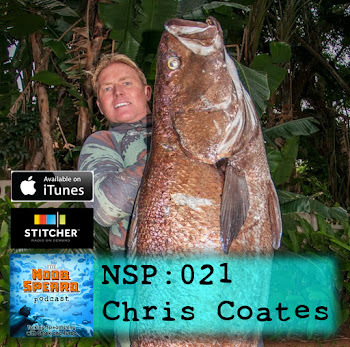 Pap Speargun Rubber, Empty Fish Blik! I am always telling guys in the shop to ensure their speargun rubbers are correctly setup. This morning I should have taken my own advice!! I have been out the water with a stomach bug and have been hearing stories of the odd cuta starting to come out. So when I woke up this morning and I did not have to bolt for the toilet. 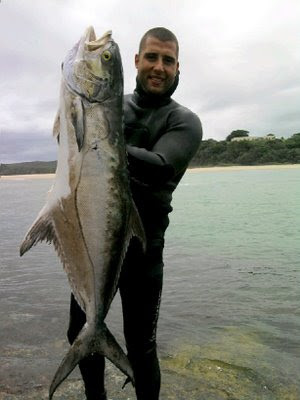 I made a beeline for my spearfishing kit and speed up the coast to a spot up north. I grabbed my 1.3 reelgun, I had heard the current was screaming and wanted to be able to hook in instead of swimming against the current. I had not used the gun since last summer and just assumed that it was all good. Anyway the long and short of it was that I tagged 4 cuta, all good shots .. I just don't think the spear went through one of them! One was a really good size fish that I shot at a fairly close distance. So you can well imagine the frustration, after the fourth fish, I swam in .... no point in tagging fish! The only up side was that I did not have to carry 40kg of fish 2km back along the beach. Tomorrow unfortunately has a busting North east from early bells and I don't think there is ant chance of a dive. 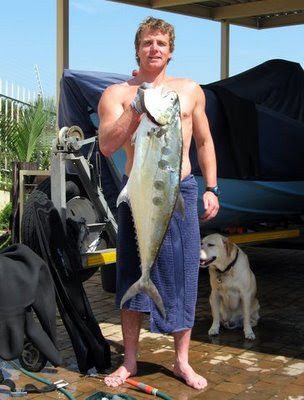 So remember ....'Pap Speargun Rubber = Empty Fish Blik"
Hey Guys sorry I did not post yesterday, I came down with a bug and was fairly cooked most of the day. ....and did not get to dive. The guy guys got in and reported seeing some fish, mostly small snoek. Hey at this stage of the game small snoek sounds tasty! They all said it was greenish and very cold on the bottom. The arvo turn yuk, with 3-4m vis and very cold, so I know some guys called todays dive off. But I think the water actualy loked ok .... from the beach. There were a whole bunch of guys up at Ponta this past weekend and they unfortunatly had green cold water, with very few good fish. There could be a couple dives this week, so keep an eye open. Sven Arro came seriously right a few days ago when he shot a 51kg Sailfish off Durban. The Sailfish was shot with a 1.2m speargun and it was on a reel! Enrico and I went out to No. 1 on Tuesday afternoon amidst the drizzle and mist to find some cleanish water. Viz was around 15 metres and fish were on the wild side. My “shik-shik machine” brought in this saily that really didn’t care much about my presence and I was able to get a good shot at close range…so a shot was let off to the head area with my 1.2m reel gun. After that, it took about 20 minutes to subdue and place on the duck. Landed up weighing in at 51 Kilos. 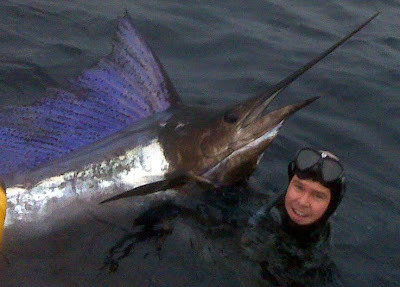 Strange I had just put up the pics of the Indo-Pacific Sailfish when a mate sent the message alerting me that Sven had nailed a big one. 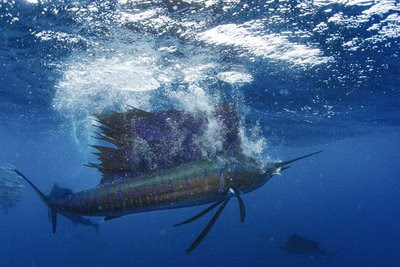 The Sailfish is a pending Salt Rock Spearfishing Record, and will be a record that will be hard to beat. Sailfish eye candy! My mate Scotty sent me these pictures from a his fathers mate, he wont tell me where they were taken ... and you can understand why. 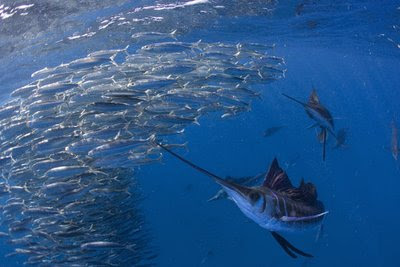 But I will be pressing him for more info on these shoaling Sailfish's where abouts ..for sure! Sailfish - Lights On! 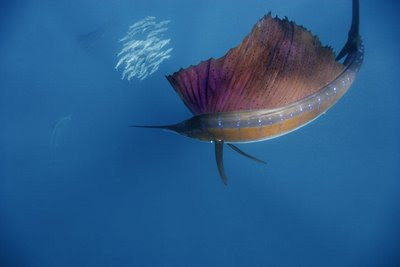 An Excited Sailfish showing its colours. 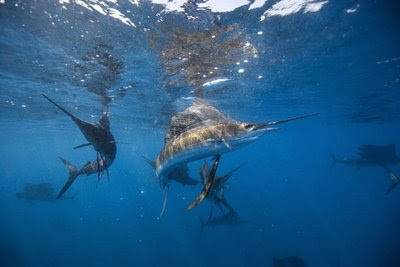 Most Spearfishermen will only take a couple of these majestic creatures in there lifetime. 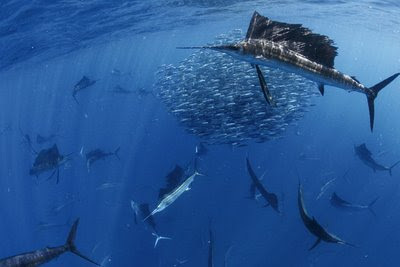 I cant wait for the day when I can get a good oppertunity to get some Sailfish like this on film ... it will be epic. I got up early and was on the beach at 4am to find a solid 6ft swell running. Unfortunately the east was allover the surf and I landed up going back to bed. The east has not pumped so I suppose that is a good thing, and I noticed that the Tongaat river is not flowing too strong so there is some hope. The bad news is that the east is on and off all the way til Sunday. So be it I suppose! I am still waiting for a write up from the guys who went to Tanzania, and will post it asap!! Morne and friends crossed the boarder into Mozambique this morning for a week at the Pinnacles! I am sure there will be a story or two when they get back. Look Out - Here comes the Surf! Sorry I did not post yesterday, was running around like a headless chicken. Oh and trying to squeeze in some diving in between as the water was crystal clean. I got in late in the arvo with my son Braiden, he missed a good sized Garrick. He was pretty bumbed until he found a pot hole full of lead. He collected 8kg for his weight making business, so he was super stoked! This mornings dive was good, the vis was great and I managed a 7kg Garrick which came in on the drop off out in 17m of water. There was not too much else going on, but it was good just to get a solid dive in. The forcast shows a large strong swell coming through this arvo and pushing through to tommorrow. It will possibly too big to spearfish, but we might get some really good waves. The rest of the week shows easterlies, so if you are desperate for a dive ... go now!! 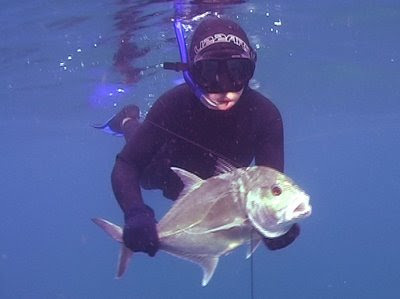 Spearfishing .. Whats coming up? Hey Guys the West is going to hit tonight and with a little bit of luck maybe the clean water will come in despite the dirty river water that is around. If the rain holds off and the clean water comes in we could have diving Sunday to Tuesday ... hold thumbs!! Andy Henwood and John Little returned from a very eventful trip to Tanzania. The Speared some great fish ...but lost some kit to some massive Doggies! I am sure Andy will do a write up which I will be sure to post. Sean O'Connor - With a Southern Mozambique Bus sized Wahoo! Owen 2x Wahoo lucky - Gee great fish! 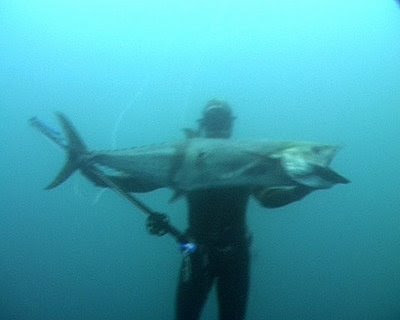 Sean o Connor and friends just got back from a Southern Mozambique Spearfishing trip. 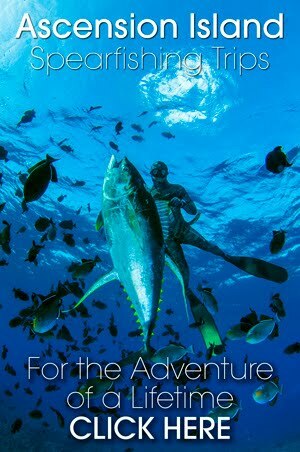 Spring time up there can have the most amazing spearfishing, but can also have the most terrible weather. The guys only got in the water on a couple occasions and I dont think they even got a whole day in. Never the less they got some great Wahoo all around the 30kg mark!! They also got some other great fish, and Sean managed a 12kg Dorado ... I bet that made some serious chow!! There is another crew going up next week, so it will be interesting to see how they do. I got in the water this morning, the vis wasnt too bad a green 6m, and a little on the chilly side. The fish were quiet and we did not see any gamefish. There were loads of Whales around, and the Sharks Board guy said he counted 6 whales off Salt Rock. The east is going to pump tomorrow and then turn south again until Sunday. So we might get in on Sunday again. Well I never got in, but the guys did find some clean water down south off Umkomass. The KZN trials went ahead and some good fish came out in the mix. What was encouraging was a report from some guys diving Aliwal shoal. They managed some cuta, a 20kg Iggie and a 30kg Sailfish that was swimming around a floating bag. 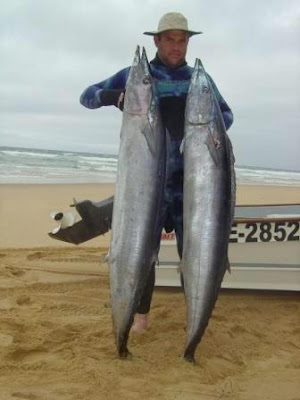 Some mates also just got back from a week at Ponta, were they battled for good conditions, but when they did get in they made up for it with some quality fish. 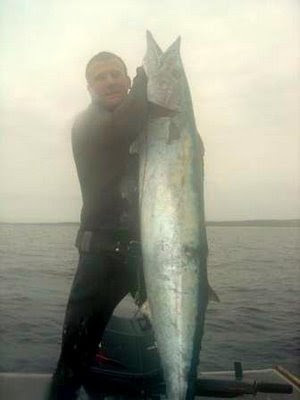 From what I heard they got 3 wahoo just under the 30kg mark among some other really good fish. This week it will be Thursday before we get in .... the tides will be starting to get high in the morning by then so it will probably mean we will be diving if the water gets clean. 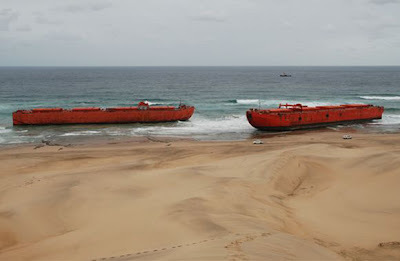 Last week 2 barges ran aground just north of Vegetation's at Cape Vidal!! I must have had my head in the ground, coz I only heard about them today. The first Barge has been dragged 24km out to sea, a little too far to be of any value to us dives. I cant see why they could not sink it in shallower water, even if it were in 40 meters it would still attract fish. The second barge is still on the shore, and they are waiting for the next spring tide to try and remove it from the beach. I heard via the grape vine that they might sink the second one in shallower water and make an Artificial Reef. Freaken yippy and much celebrations!!! Imagine that a barge of that size up at Vidal!! My mind is doing flick flacks at the diving to be had!! All they need to do is make sure that the barge sinks parallel to the current, so we can do nice long drifts down it length as it lies in 25 - 35m of water ....depth i am not to fussy about tho. My only fear is that the bunny Hugger's will get there paws on the wreck and make it off limits like the Nabo and Produce! 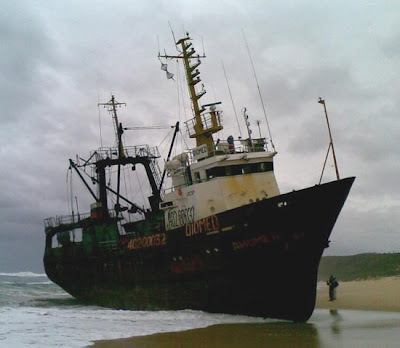 Also in the last week or so a Trawler called Diomed ran aground just north of Banga Nek, about 15km south of the boarder. 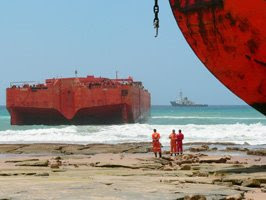 This vessel has been taken off the beach an was being towed away when it apparently under mysterious circumstances sank! Unfortunately it is 250m of water, another diving opportunity wasted!! Hey Guys its Club Nite on Friday! And there is a new DVD to watch ... apparently it is outstanding and there are over 100 species of fish, a film that has taken a couple years to put together!! We will do the usual "Dop en Chop", but in the event of rain just bring a pizza or something to share. We will also be looking ahead to next year and some of the plans to try and get more diving in ....so pull in and check it out. On the weather front the east is going to pump then turing tio a South West on Friday and Saturday, so with some luck Sunday will be diveable. Its about time some one broke a record at the Salt Rock Spearfishing Club. Morne just pips the old record 10.50kg that was set in November 2004 by Ivor Sykes. Tide - High but the wave is coming off the point. I shot home, grabbed a coffee and my board, boardies and a towel. Tide - Who cares the surf is alover the place! Thats how my morning started :-) - I suppose it could have been worse, like sitting in traffic!! The weekend had some nice surprises! I did not think that the dive or surf would be good, and we got both! Sunday the west was blowing but it was sunny and there were some super fun waves at surfers beach. The banks arnt bad and with some luck there will be some good surfing going down this week. Looking a head a little .... It is Salty Club Nite on Friday so make sure you are free to join us.